Getting Married in Vegas – Again? Last year, for our wedding anniversary, I convinced my husband to plan a trip to Las Vegas so we could renew our vows in the Elvis Chapel. Had I suggested renewing our vows in a quiet backyard ceremony, he would have nixed the idea, but anytime you put Las Vegas into the picture, he is ready to go. I had never been to Las Vegas, so I was anxious to see what all the fuss was about. Another extra bonus for this trip was that our daughter could come along too. She turned 21, so what better way to ring in her legal age than Vegas. I also thought it would be great if she could be my maid of honor at this ceremony. When I made the reservations for the wedding chapel, the nice woman on the phone asked if I wanted the skinny Elvis or portly Elvis to perform the ceremony. I opted for the skinny one because I like the movies with the younger Elvis. He is handsome and not so sweaty looking. She booked the skinny Elvis and told me that they would take care of everything else. I did not have to plan a thing, and they were true to their word. What I didn’t tell my friends was that when I was shopping, I saw a red dress I liked a lot, but the saleswoman told me that a red dress, even for a renewal ceremony shouted “Tart”. Yep, Tart was the exact word she used. Not wanting my Elvis ceremony to reflect a “tart” theme, I went with the blue. The Elvis people sent a limo for us, and we marched through the hotel in our wedding finery. People kept shouting “Good luck!” I gave my best Queen Elizabeth wave back to the well wishers. Well, I forgot I was in heels. If there is one person in this world who should not attempt any physical movement while wearing heels, it is me. I lost my balance and literally fell into the back of the limo. Luckily, I was wearing underwear. When we got to the chapel, the hostess escorted my husband to the front of the aisle, and my daughter and I to a backroom. 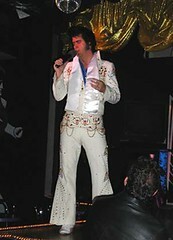 Our Elvis minister came into the room to go over the ceremony. He had on the white jumpsuit opened to the navel, a colorful lei around his neck and, and he appeared to be about 60. Hm. I didn’t expect him to be this old, but I guess this is what Elvis would have looked like if he got off the drugs and lived another 20 years. Then Reverend Elvis burst into song and serenaded us with “Fools rush in”. He had a very nice voice, but my daughter lost it, and then I lost it. We share this giggle trait. When we are nervous, we giggle, and for some reason, we were both nervous. Skinny Elvis didn’t seem to mind though, and he sent my shaking-with-laughter daughter down the aisle. Then he took my arm and as he crooned “Love Me Tender”, he escorted me to the front of the chapel. The chapel also did a live feed so our relatives and friends back on the east coast could tune in. I will be blunt: I do not video or photograph well; ask my mother. She will tell you flat out that I do not take good pictures. My original wedding album contains about five pictures because we could not find any photos of me where my eyes stayed open. On video, my hair takes on a life of its own, and my voice makes Minnie Mouse sound like a baritone. When it was all over, we took a lot of pictures with Elvis, and they gave us a DVD to have as a remembrance of this special day. We watched the DVD that night in the hotel, and it showed me that I needed to order a month supply Nutrisystem as soon as I got home. Now that I have thinned down again, I want to go back to Vegas and redo the ceremony in front of the camera. I am determined to look good. This time I won’t go the Elvis route. I saw a place that does a vampire theme. It might take a lot of convincing to get my husband to participate in a blood-letting- themed renewal ceremony, but he might give in if I let him spend a day at sportsbook. After all, marriage is about compromise and nothing says romance like a chomp on the neck! 7 Responses to Getting Married in Vegas – Again? My wife and I got married in Vegas and we’re going back in November for our anniversary. You don’t think she’ll care if all we do is snort coke and eat at buffets the whole time, right? Nah. You gotta do in Vegas what makes you most comfortable. That is true romance. If snorting coke and eating is your thing, do it. I don’t think that advice would win any drug counseling awards, but oh well! I agree. Go for the red dress the next time. I would, and I am such a Goody Two Shoes that I almost won a fluffy bunny award once. Remember, if you do this again, you’re remarrying your husband not the dress sales lady. Men don’t think “tart” with red; they think “hot”. Go with the red. Las Vegas can take a bite out of your wallet, even if you avoid the vampires! Elvis sounds romantic, but I was hoping for a Vegas story ala “Hangover”! And you’re right, tarts may at the reception but never at the wedding itself!